The Blaine Manor skilled-nursing home has been ranked the fifth best nursing home in the state; however, Administrator Gail Goglia said that's not good enough. "We want to be No. 1," she said. "We'd like to tweak everything." 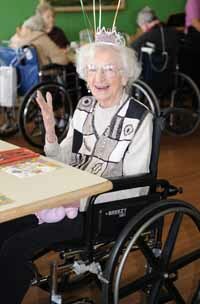 The Hailey nursing home is in the top half of a list of the state's top 10 nursing homes, according to U.S. News & World Report. While Blaine Manor ranked above facilities in Boise, Emmett and Lewiston, it fell behind the Ashton Living Center, Idaho Elks Rehab Hospital, the Eastern Idaho Regional Medical Center and the Owyhee Health and Rehab Center. According to U.S. News & World Report, the rankings are based on data from Nursing Home Compare, a consumer website run by the Centers for Medicare and Medicaid. The data are based on health inspections conducted by state agencies and from information reported from the homes themselves on resident quality of life. The rankings do not include assisted-living facilities or retirement communities, both of which provide less care than do nursing homes. "We are proud of this honor and the level of care we provide to our residents," Goglia said. "We have quality people and good systems in place." The Centers for Medicare and Medicaid gave the manor a five-star quality rating based on its performance during health inspections. Goglia said Blaine Manor's ranking generally hovers between four and five stars, depending on the year. "Part of the problem with that rating is we have such a small sample here that one event can skew the results," she said. The standards measured by health inspections include safety of food preparation, medication management, resident quality of life and even proper skin care. Blaine Manor had eight health deficiencies during its last two inspections, below the state average of 10. Blaine Manor ranked above both state and national averages in total hours of staff time per resident, even coming in slightly above the number of hours per resident reported by Aston, the top-ranked home. However, the report also shows that Blaine Manor is well above average in the percentage of its residents who are depressed or anxious, as well as those whose mobility decreases during their time at the facility. The facility reported that 31 percent of its residents are depressed or anxious, and 30 percent lose the ability to move in and around their rooms. The state averages for these standards are 17 percent and 10 percent, respectively. However, Goglia said the residents are "basically content." "We have an extremely elderly population, and people do decline as they age," she said. "They have a decrease in mobility, they have a decrease in cognition. This often makes them depressed, but when they're in their mid-90s, you will see those declines." Goglia said the manor staff will continue to improve its level of service and predicted it will become the state's best nursing home. "It's doing more of what we're doing, making sure we have a stable staff and that we have good systems in place," she said. "To get quality (care), you have to have quality people."